Art Kaarisilta gallery invited Andersson for a solo exhibition. Because of Andersson’s interest in making site specific public art as well as architecture, nine years have gone by since his last solo gallery exhibition (Sculptor gallery, Helsinki, 2003). Andersson accepted the invitation, inspired by the fact that the Kaarisilta gallery is situated inside a shopping arcade in the absolute center of Helsinki, which makes the space very communicative and easily accessible for people who normally wouldn’t step into an art gallery. The exhibition included three works. 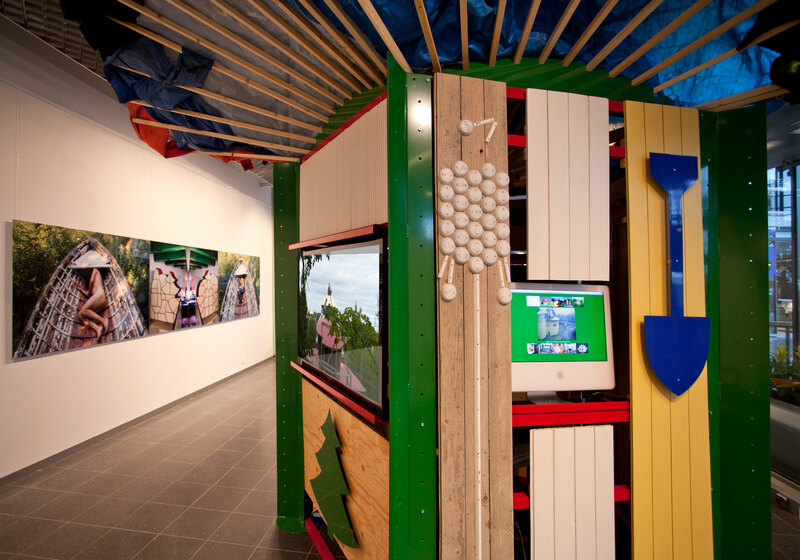 The main installation is the Life on a leaf Video Kiosk. 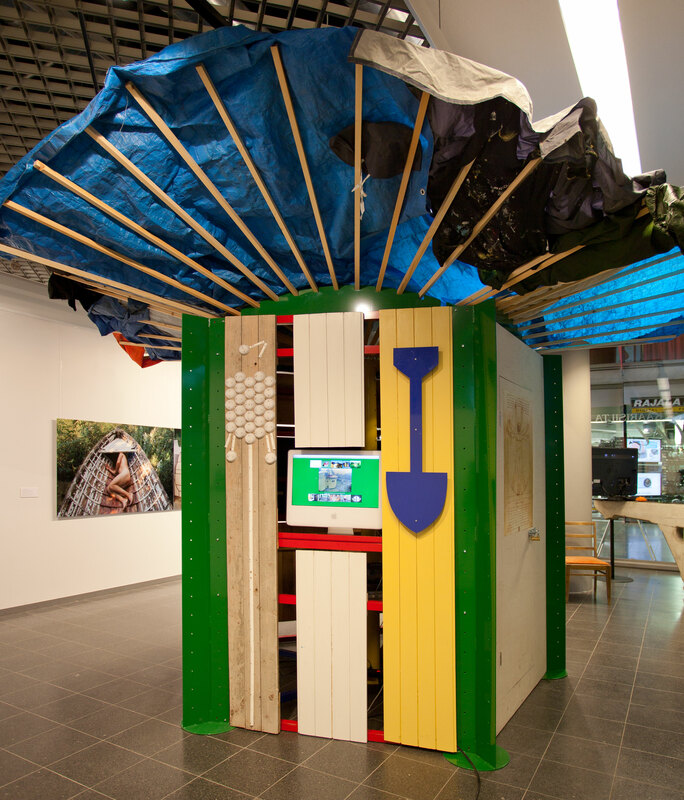 The Kiosk shows, through three videos and a web cam, the long building process of the Life on a Leaf house and the artworks incorporated in the house as well as and the life through the eyes of Adrian, who has grown up with the house. The Life on a Leaf house, built as a total artwork in Turku, Finland, explores the creation of Iconic space through the use of a figurative floor plan, figurative windows and ornamentation as well as using sound as an ornament. The house challenges contemporary architecture and creates a vision for the future, by being inspired by fairy tales, dreams, humour, nature, and iconic shapes. 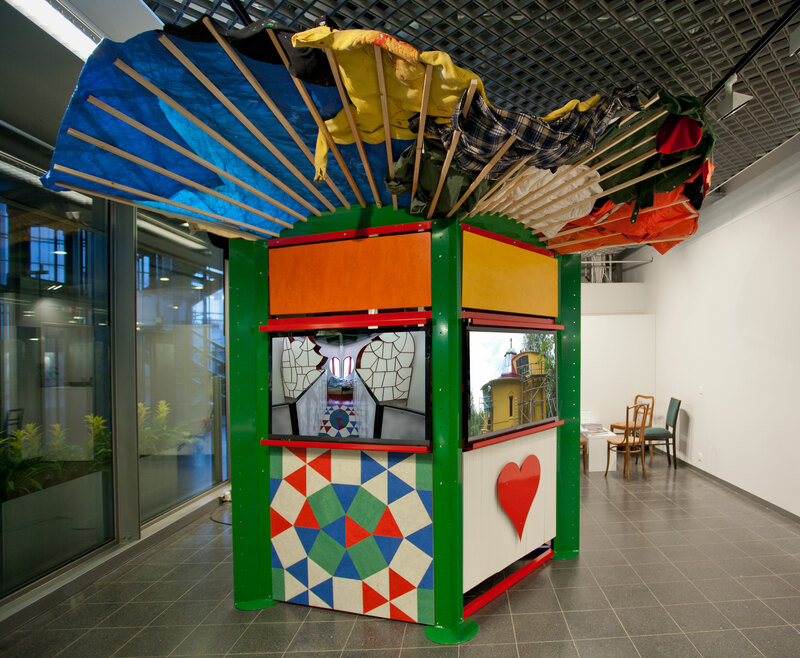 The walls and the roof of the Kiosk are made of left over materials from the building process. The second artwork Hidden in the Prow is a 4,5 meters wide photographic triptych, a Chromaluxe metallic print, partly produced in Photoshop. 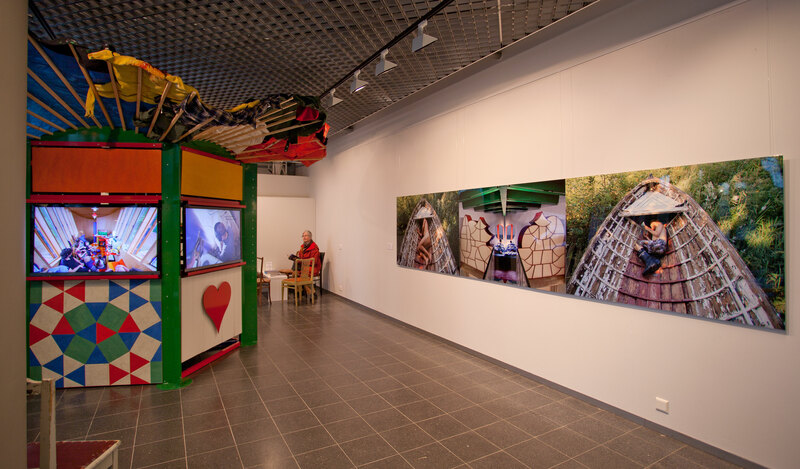 Here Andersson attempts to connect the sensation of built ”real” space with memories from childhood, when he was doing trips with his father in a small boat, where he lay hidden in the prow, one of the few places (or spaces) he felt secure during his childhood. A book made his imagination fly away, accompanied by the lapping sound of the waves. The left picture of the triptych shows Andersson in the boat fifty years later, when his father is dead and the boat is decaying. The right picture shows Adrian in his fathers place. The middle part of the triptych shows a picture from the leaf shaped Life on a Leaf house, the home of Andersson’s family, where Andersson is looking out through the loft window together with his son Adrian. Only after living in the house fore some years Andersson realized the similarity of the space created in the loft with the space created in the prow of the boat. To enhance the effect Andersson digitally added a seascape outside the heart shaped window. 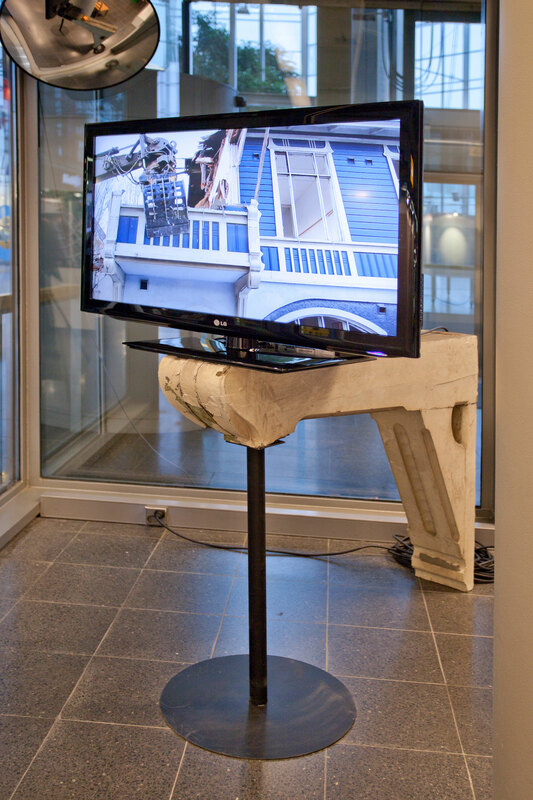 The third work is a video installation called The Destruction of Beauty, which through a video, originally published on YouTube, shows the tearing down of the Blue House, an iconic Turku Art Nouveau building, in 2011, when Turku was the Cultural capital of Europe. The video stresses the importance of the mental space ornate buildings create in the urban environment. The monitor is placed on a wooden part of the original ornamentation of the house, saved from the demolition process. Monitor 3: Life in the House, 2010-12. HD video on Bluray. Computer screen: Webcam from the Life on a Leaf house. Print on Kiosk door: Life on a Leaf and the Vitruvian Man, 2011. The walls and the roof of the Kiosk are made from left over material from the building process. 2. From the Iconic Space series: Hidden in the Prow. 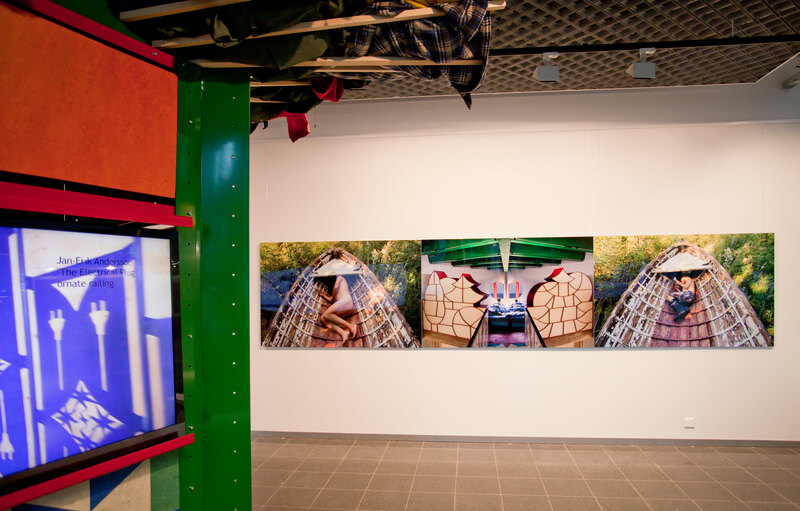 Photographic triptych, 2012. Chromaluxe metal print. Part of building with HD video on Bluray. The video was first released on YouTube to influence the debate about to role of ornate wooden building for the built environment. Watched 143,720 times 13.2.2015.